With the greatest of respects to Bognor Regis, the town probably isn’t considered one of the world’s great romantic locales. Paris? Yes. Rome? Yes? Bognor Regis? Erm… not so much. Yet, today, on the day of my twelfth wedding anniversary, it is in the famous old British seaside resort where I have ultimately decided to spend my afternoon. 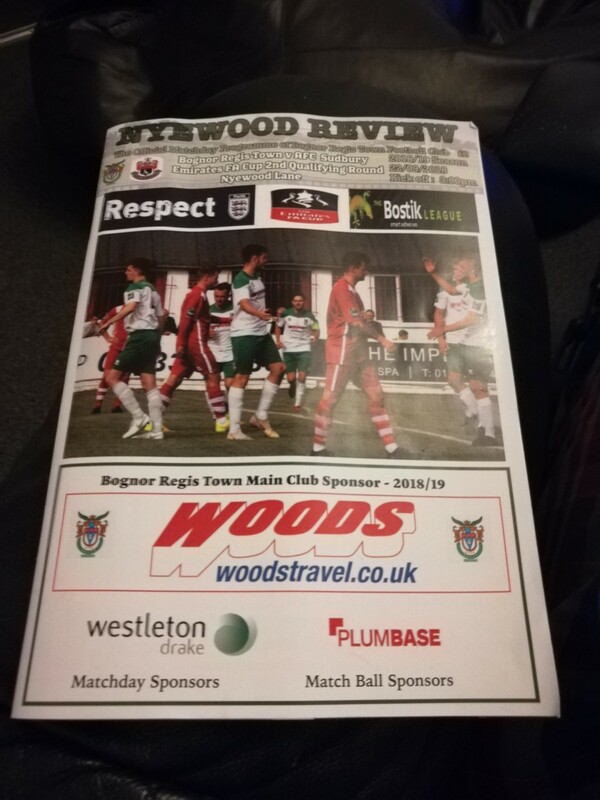 Or, to be more specific, it is at Bognor Regis Town FC’s Nyewood Lane where I have decided to spend my afternoon. For it is the fourth FA Cup weekend of the season (yes, already) and having attended a match in the previous three rounds I was desperate to keep the run going. Thankfully, I have an understanding wife. Now I’m not totally unromantic. My heart is not made of stone. I have brought my other-half to Bognor with me. Okay, so she has decided to go shopping rather than to attend the football, but we still travelled to Bognor together. That surely counts as me taking her out for the afternoon, right? Somewhat surprisingly, my two sons have chosen to accompany the missus shopping, rather than spend a wet and windy afternoon watching FA Cup football. For varying reasons, it’s the third consecutive Saturday that I’m flying solo. Bliss. I could get used to this. As befits a side which up until last season were plying their trade in the National League South, Nyewood Lane (referred to locally as the Nye Camp, or so I'm lead to believe) is arguably the best-looking ground that I’ve been to thus far on my inaugural season of groundhopping. Covered terracing runs pretty much the entire width behind the far goal, and along the majority of the far touch-line. On the opposite side is a small covered seated stand and a smaller covered terraced area. This is a pleasing discovery, There are plenty of places to stay dry as the rain lashes down from the grey, leaden sky. There’s also a rather impressive electronic scoreboard (the first I've seen so far) in one of the corners of the ground. Had my youngest been with me he would undoubtedly have been sent into a fit of uncontrolled excitement by this sight! He’s been desperate to see a scoreboard all season. Upon spotting it, I immediately phone my wife to relay the news to her and ask her to inform our youngest. ‘Don’t tell him, he’ll be gutted,’ she whispers under her breath, desperately not wanting the little’un to overhear our conversation. The relative splendour of the ground does come at a cost (again, relatively speaking). At £12, the admission fee is the most expensive that I’ve encountered so far this season. 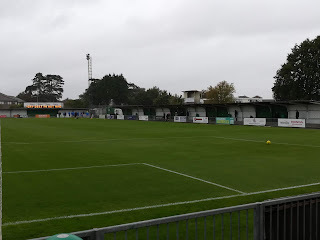 However, as already mentioned, The Rocks were in National League South last season, so it stands to reason that the price is a little higher than that at grounds of teams at a similar level. A quick word here for the program (£2) which is excellent – the best so far. 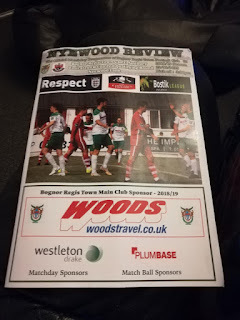 In fact, the three Bostik Premier clubs that I’ve been to this season (Bognor, Worthing and Tonbridge Angels) have all offered excellent programs, which is great news for traditionalists like me, at a time when many clubs are looking to go digital. Please don’t! Just don’t. Or at least not solely. As kick-off approaches I witness another first of the season – at least at non-league games, anyway. A mascot. 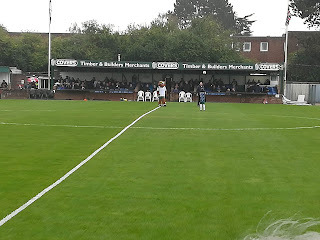 Rather bizarrely, Bognor Regis Town, nicknamed The Rocks, appear to have a bear for a mascot. Now I’ve got no idea what connection Bognor has to bears, I doubt you see many wandering along the promenade, though. (Regular readers of this blog will know that I have no inclination to do any research to find an answer to my question), but as a total guess I’m going to suggest it has a link to the nearby Butlins? Any actual answers to this query would be greatly received in the comments section below. Having thrashed Sussex and Bostik Premier League rivals Whitehawk 8-0 in a Velocity Cup match in midweek, confidence around that the ground (at least among home supporters) is high that the hosts will be able to easily overcome the challenge of their lower division opponents and progress one step closer to Wembley. AFC Sudbury (an amalgamation of Sudbury Town, once FA Cup conquerors of now Premier League Brighton and Hove Albion, and Sudbury Wanderers) are currently mid-table in the Bostik League North. This feeling is enhanced after just three minutes, when a dreadful back header by a Sudbury defender is latched onto by Tommy Scutt, and his pass across goal is tapped into an empty net by the Rocks’ skipper Harvey Whyte. For the opening ten minutes it appears that the outcome of this game is going to be a mere formality. Bognor Regis boss proceedings and have a couple of half-chances to double their advantage. However, the visitors are surprisingly level after 11 minutes when the home defence fails to deal with a hopeful cross into the box. After ‘keeper Daniel Lincoln fails to cling onto the ball under pressure, Callum Harrison headed in an equaliser against the run of play. Lincoln obviously felt aggrieved at not getting a free-kick, and I must admit to being surprised myself. Not because I think he was necessarily fouled. I don’t think he was. Yet normally any contact on a goalkeeper (of which there was) results in a free-kick, rightly or wrongly – often wrongly in my humble opinion. Not this time, though. 1-1. For the rest of the half, Bognor dominate possession and create a string of half-chances that they fail to capitalise on. For their part, AFC Sudbury look like they’d sell their own mothers in exchange for a replay at this point. A number of defensive mistakes throughout the half should allow The Rocks to restore their advantage, but they don’t and half-time arrives with the teams surprisingly level. The second half starts in much the same vein. Bognor Regis certainly see more of the ball, but are often ponderous in possession, and on countless times are guilty of overplaying. The visitors, however, do show more intent in the second half and look increasingly dangerous on the break as the half wares on. In fact, it is AFC Sudbury who come closest to scoring the decisive goal when a thumping long-range strike from right-back Baris Altintop beat Lincoln, only for the ball to rebound off the crossbar. 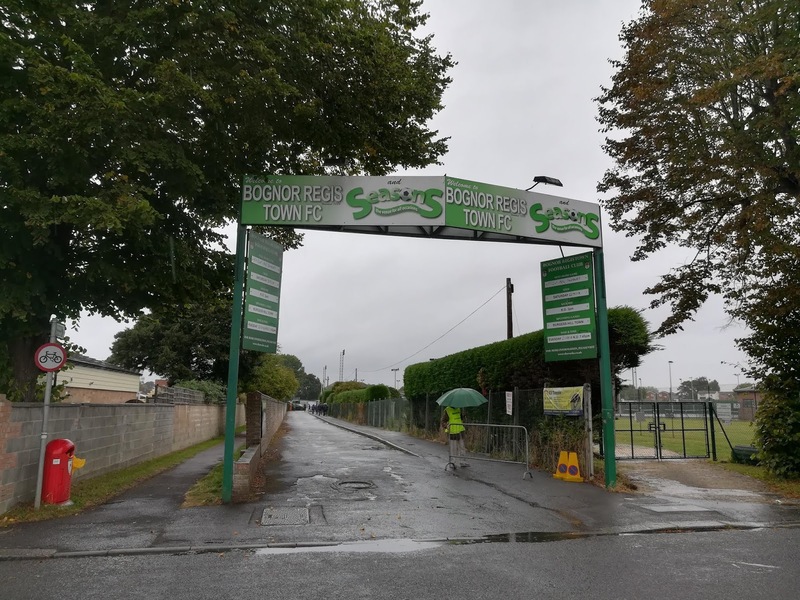 Towards the end of the match, Bognor’s inability to capitalise on their territorial advantage becomes an increasing source of annoyance for their frustrated fans. More than one or two are heard to suggest they must have used up their share of goals in their midweek rout of Whitehawk. Who knew goals worked on a time-share basis? So the romance of the FA Cup is still alive for Bognor and Sudbury. Both will be in the hat for Monday’s third qualifying round draw. Whether the romance will still be alive for me after my decision to take a romantic excursion to rainy Bognor Regis on my wedding anniversary, however, remains to be seen.